An Australian strategist suggests an alternative to confrontation between the superpower and its rising challenger. My fellow Americans, Forty years ago, one of my predecessors went to China and changed the world. He turned its most populous country from a bitter enemy of America into a cautious friend. In doing so, Richard Nixon brought China into the global economy. Now China's economy is changing the world, which in turn has great consequences for America. There is a truth we need to grasp. Within a few years, China's economy will be bigger than America's on some measures. Within a couple of decades, it will be bigger than ours on any measure. Ultimately, this is a matter of numbers. America's economy has been the world's biggest for 130 years because our work force is both very big – the third biggest in the world – and very productive. China has many more workers, but they have been much less productive, and so its economy has been smaller than ours. But China's productivity has grown remarkably in the past three decades. They have been having their own industrial revolution. With a workforce four times as large, China needs only one-quarter our per capita productivity to overtake us and become the largest economy in the world. That is what is now happening. This change is not about America. It is about China. America remains, in itself, as strong, resilient and creative as it has always been. But if we assumed that America would always remain the world's largest economy when China had the world's largest workforce, it could only have been because we believed that Chinese workers could never become even a quarter as productive as we are. And how could we ever have believed this? Well, many of us have believed it because of China's political system. We have held firm to the idea that only a system like ours can unleash the full creativity of a people. I share that belief. And yet we simply cannot ignore the fact that China's government, for all its faults, has presided over the greatest increase in material welfare in history. Perhaps it will not last. Perhaps China's people will demand more political freedom and participation from their rulers. But if they do, will that slow their growth in the long run? If the people of China do indeed take the path to democracy, it is more likely – once the turbulence subsides – to strengthen their economy than to weaken it. As China's economy grows, the other dimensions of its power will grow, too. We need to recognise this, but we need also to keep it in perspective. China will remain a strong country, but it will never rule the world. It will have to deal with many other strong states – Japan, India, Russia, the EU and, of course, the US. Unlike us, it will have little ability to project its military power over the seas, even in the western Pacific. While its interests will expand around the world, it will remain focused on East Asia. But as China's power grows, I believe it will want to be a great power again, and to be treated as a great power by others. That raises a question: how will China use its power? Will it be a harsh bully or a co-operative partner in a regional order? The answers are not yet clear. One thing, however, is clear. China's ambitions are not compatible with the old order, the one that has kept the region peaceful and prosperous for four decades since Nixon met Mao. Since 1972, America's role as the leader of Asia has been uncontested by any other major power. We have been not just a leader in Asia but the leader in Asia. But today we face a new reality. China has begun unmistakably to contest American primacy in Asia and the regional order that has been built on it. The choice America faces is how we respond to China's challenge to our leadership of Asia. I believe we have three alternatives. First, we can withdraw from Asia. However, this would leave Asia to be dominated by China, or devastated by the rivalry of Asia's great powers. This would threaten both America's security and its economy. There is no peaceful and prosperous future for Asia without a strong US presence, and there is no peaceful and prosperous future for America without a peaceful and prosperous Asia. Second, we can push back against China's challenge, aiming to maintain our supremacy and compelling China to accept it. For many this is a natural, instinctive response. And if China is determined to dominate Asia by force, it will be the right response. But we should be under no illusions about its cost. China will not simply back down if America pushes back. It would push back at us, and we would push back again in turn. In this fashion, America would find itself in a new and dangerous era of rivalry. The third option is to seek an agreement with China about a new order in Asia, an order that would allow China a bigger role, but preserve a significant role for America in keeping Asia secure. By remaining engaged, America will balance China's power and help ensure that its power is not misused. By stepping back from primacy and allowing China a bigger role, we will seek an accord that avoids the risks of rivalry, while preserving America's key interests. The essence of such an accord is simple. America and China would share power in Asia as equal partners in a joint regional leadership. That does not mean we would agree about everything, but it does mean we would manage our disagreements carefully. Such a deal would depend as much on China as it does on us. China would have to accept that it will not be able to take over the leadership of Asia, as I'm sure many Chinese hope and expect. It would require them to accept that their country, for all its wealth and strength, will be subject to the checks and balances imposed by American power. Many in China would not want to accept this state of affairs. They would argue that China should push America out of Asia and take its place as Asia's primary power. 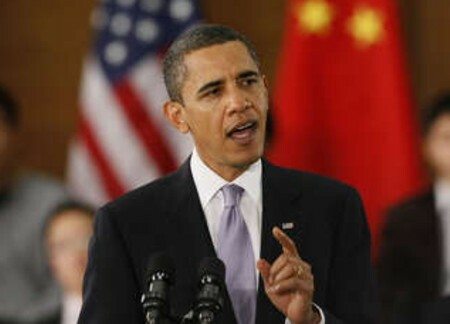 To them I have a clear message: America will not accept Chinese primacy. We do not believe that such primacy would be accepted by China's neighbours in Asia. If now, or in the future, China tries to impose it upon them by force or other forms of pressure or intimidation, America will lead them in resisting China. But if China is willing, America will work with it as an equal partner in a shared leadership to build and maintain, with other countries, an international order in Asia that conforms to the broad principles laid down in the UN Charter. America, too, faces a hard choice. Throughout our history we have seen ourselves not as a country like other countries, but as a nation apart. An exceptional country. This has always posed a profound dilemma for our foreign policy: how do we reconcile our sense of exceptionalism with the need to work as a nation among other nations in the international community? And how do we remain true to our exceptional nature while working with the world as it is? The answer has always been that we must deal realistically with the world as we find it, or sacrifice our own interests and those of wider humanity. Even so, many will say that never before in our history have we dealt with any country as an equal in the way I am proposing we deal with China. That is true. But never before in our history have we encountered a country like China – a country with the potential to become as rich and strong as China is set to do. America is going to have to deal with the world rather differently from now on, not because America has changed, but because the world is different. Many will say that America cannot deal with China as an equal because its values are so different from ours. China's government suppresses political dissent, denies religious freedom and perpetuates a political system that deprives people of the right to choose their own government. We should deplore these things, and I do. In justice, however, we should also acknowledge that many good things are happening in China. Hundreds of millions of Chinese live better, fuller lives than their parents could have dreamed of because of the economic growth China has achieved. Better homes, better schools, better food, better jobs, better healthcare – these material things have real moral value, and it would be dishonest not to acknowledge this achievement. Treating China as an equal does not mean that we should ignore the bad things that happen. It means that we should consider carefully what kind of relationship would be best for the people of America, and best for the people of China, and best for people everywhere. The choices we face about our future with China have real consequences for the kind of world we will live in. Once Americans accepted the burden of leadership because it was the only way to keep America safe and the world at peace. But they also recognised that in time a new order could arise in which the US worked with others as equal partners to keep the world stable and prosperous. President Nixon had such a vision before he went to China. In 1972 he told Time magazine, "I think it will be a safer world and a better world if we have a strong, healthy United States, Europe, Soviet Union, China, Japan, each balancing the other." And President Bill Clinton said a decade ago: "America has two choices. We can use our great and unprecedented military and economic power to try to stay top dog on the global block in perpetuity. Or we can seek to use that power to create a world in which we are comfortable living when we are no longer top dog on the global block." Today we confront that choice. I think most of us would agree that America's political system has not been at its best these past few years. The tougher we politicians have talked, the more reluctant we have been to face tough facts and take tough decisions. Perhaps we feel America is so strong that we do not need to see the world as it really is. That would be a historic mistake, and contrary to America's true strengths and virtues. We need now as a country to debate our future with China carefully, soberly, responsibly and realistically. America's future depends on it. This is an edited extract from The China Choice: Why America Should Share Power, by Hugh White, published by Black Inc. ($29.95) on Monday. Also available as an e-book. Fellow Financial Times columnist Niall Ferguson has received some fierce criticism for a piece he wrote in Newsweek, under the provocative headline: “Hit the road, Barack”. Among various complaints, critics cried foul over a graph showing that the International Monetary Fund predicts that, on current trends, China will overtake the US to have the world’s largest economy in 2017. They have a point. Nobody disputes this claim (in a chart headed “A nation losing ground”). But this event would be no indictment of US economic policy under President Obama, or his predecessors. China has four times the population of the US; parity would mean that Americans were still on average four times richer. Indeed, US business and the US economy desperately need China to keep growing. Mr Obama need not be embarrassed when China’s economy overtakes that of the US; but he should lose a lot of sleep over any suggestion that China might fail to do so. On that basis, China should be causing sleepless nights in the White House. The latest flash estimates for China’s purchasing manager data, designed so that 50 should be the dividing line between expansion and recession, are now at a nine-month low of 47.8. Western analysts are notoriously nervous of official Chinese data. However, commodity prices are something of a truth teller. Iron ore prices, driven almost exclusively by Chinese demand, have fallen by a third since April. Copper prices are also mired in decline. Stock markets, too, are raising red flags. China’s domestic stock market is the most eye-catching. The Shanghai Composite index this week dropped to a low last seen in March 2009 – the month the developed world’s stock markets started their great recovery. It is down 66 per cent from its 2007 peak, and has underperformed the S&P 500 by 32 per cent since the beginning of last year. True, Shanghai stocks enjoyed a classic speculative bubble in 2007. Their collapse follows a pattern typical after such incidents. (Charts showing how similar the Shanghai bubble was to the earlier Nasdaq bubble are to be found on the FT’s Long-Short blog). In any case, stock market growth is not closely tied to economic growth, at least on a year-by-year basis. But then look at how woefully Chinese stocks open to western investors, as represented by the MSCI China index, are underperforming MSCI’s index of US stocks. Since the beginning of last year, they have underperformed by 26 per cent. But this measure is also imperfect. Big US companies are themselves heavily exposed to the Chinese economy. When western stocks are analysed by their exposure to the Chinese economy the problem becomes most apparent. Deutsche Bank’s baskets of large European stocks, divided according to their greatest international exposures, show that China-exposed companies have underperformed US-exposed stocks by 40 per cent since the end of 2010. This is chiefly driven by mining companies, who cannot counter investors’ alarm about China’s attempt to refocus growth away from investment projects and towards consumption. Miners’ share prices already appear adequately to discount the low materials prices, and indeed seem to be projecting them far into the future. Globally, materials companies have underperformed developed world stocks as a whole by 20 per cent since the beginning of last year, according to MSCI indices. Some sectors fare better. Luxury goods companies, also heavily exposed to China, have been doing fine. But this is not just an issue for miners. The grain of what executives in other industries are telling their investors suggests that they, too, are concerned about the consequences of investment decisions in China. In combination with the political risks in Europe and the US, this has led many decisions to be postponed. Goldman Sachs produces a quarterly “beige book” compiling managements’ comments during their investor briefings. One of the clearest themes of the latest edition is concern over global growth, which largely comes from China. Caterpillar, for example, said that it was lowering production there and intended to cut production further. The greatest hope of optimists among executives, at least as parsed by Goldman, is that China can rebound and execute its growth shift successfully. United Technologies, for example, rhapsodised over the possibilities for growth in demand over the next 15 years. IBM reported very strong growth in computer sales. The upshot for the US is clear. Everyone needs to be offering up a prayer that China does indeed overtake the US on schedule, three years from now. That would help Americans grow richer.